Journey deep into a cavern where favorite Disney tales come alive in a dazzling display of music, light and wonder! Come aboard for the experience of a lifetime—an excursion on course for a world of magic and enchantment. You’re about to discover a fantastic realm energized by imagination. Here, inside a legendary cave, make-believe comes alive in spectacular displays. And those who visit are inspired to forge their own adventures, and follow their dreams. The voyage begins at Fantasy Landing. 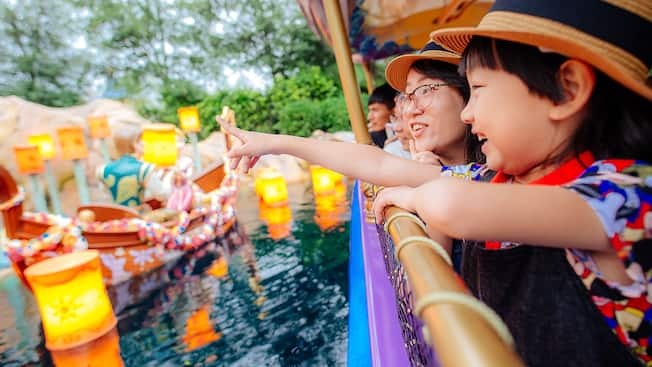 Soon, you'll wind past magnificent sculpture gardens dedicated to timeless Disney epics like Beauty and the Beast, Aladdin, Mulan and many more. Each breathtaking display captures a spirit that entertains us with fun, romance and music, and inspires us with uplifting messages. As you approach the Grotto, the excitement builds and the magic grows stronger. You’ll see, hear and feel classic stories spring to life within the walls and waters of the cavern. Experience the exhilaration as you’re surrounded by an astounding spectacle of motion, color and vision. Once you’ve taken this incredible Voyage to the Crystal Grotto, you’ll never see your favorite fables the same way again! Celebrate the stories that spark the imagination and inspire us all to follow our dreams. To honor the discovery of the Crystal Grotto, the people of Fantasyland created enchanted sculpture gardens along the waterway lining its approach. Each honors one of the tales inside the cavern—and lives on as an enduring part of the Disney legacy, reminding us to follow our hearts and hold onto our dreams... happily ever after. These stories are enduring parts of the Disney legacy because they remind us to follow our hearts and hold onto our dreams... happily ever after. Beauty and the Beast – Based on a French fairy tale, this blockbuster Disney animated feature—and worldwide theatrical hit—showed us how love and kindness can overcome hatred, and that what we feel in our hearts is more important than what we see with our eyes. Aladdin – Inspired by the timeless legend of 1001 Arabian Nights, this delightful Disney feature proves that, no matter where you start out, there's no limit to where you can end up. With wit, courage and some Genie magic, Aladdin overcomes an evil sorcerer and wins a princess’ heart to rise from 'street rat' to sultan. The Sorcerer's Apprentice – This enchanting vignette from the Disney classic Fantasia is a vivid reminder of the power of imagination. When Mickey Mouse dons his master’s magical cap, he has the power to bring a broom to life to do his chores. But when he can't control his creation, the results are alarming and hilarious! Tangled – The Brothers Grimm's Rapunzel legend is retold in a story that empowers us all to break away from what holds us back. Like our courageous heroine and the daring Flynn Rider, we must follow our hearts and dreams to realize our true potential. Mulan – Based on Hua Mulan, this endearing film marked the first time that Disney animation brought a Chinese legend to life. Mulan is a young woman who poses as a soldier to take her father’s place in the army. By defying her culture, she helps save her nation. An uplifting tale of loyalty, courage and honor, Mulan proves there's a hero inside all of us. The Little Mermaid – In a fun-filled, musical version of Hans Christian Andersen’s timeless tale, Ariel the mermaid is ready to give up everything she has to become part of our human world. For all of us who yearn for something more, The Little Mermaid shows us that 'happily ever after' is never out of reach—even if it's a world away.